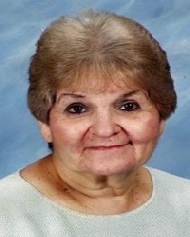 Alicia Garcia Arredondo obituary. Carnes Funeral Home. Ms. Alicia G. (Garcia) Arredondo, born on March 23, 1930 in Baytown, Texas, to the late Maria Canales and Angel Garcia, passed away at age 89 on April 7, 2019 in Houston, Texas. She was a prayer group member at Apostles of Goodwill, a prayer group member at Funeral Ministry, a prayer group member at The Women's Club, a prayer group member at St. Vincent DePaul, and a prayer group member at Guadalupanas. Alicia is preceded in death by her sons, Rodney Arredondo and Randy Arredondo. She is survived by her sons, Roland Arredondo -Lena, Ron Arredondo- Gail, and Robert Arredondo; daughter, Elsa (Millie) Mikeska - Steve; grandchildren, Stephanie Arredondo, Natalie Ferraro, Lisa Arredondo, Kathryn Cobb, Karyn Fontenelle, CJ Duncan, Grace Arredondo, Lawrence Arredondo, Elizabeth Arredondo, Joseph Arredondo, Anna Arredondo, Angela Arredondo, Angel Rocha, Lauren Harrigan, and Harley Mikeska; twenty-three great-grandchildren and three great-great grandchildren. On Monday, April 15, 2019, friends and family are invited to attend a viewing at 5:00 P.M. followed by the Rosary Service at 7:00 p.m. at St. Frances Cabrini, 10727 Hartsook, Houston, Texas, 77034. Funeral Mass will follow at 9:30am on Tuesday. Interment will follow at South Park Cemetery in Pearland, Texas.